Summary: Mac can’t lose another friend. Even if he doesn’t want to be found. 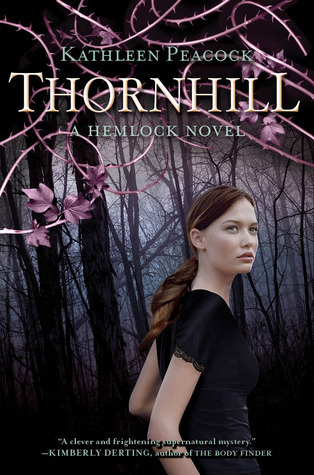 My Thoughts: I liked Hemlock but I didn’t outright love it. With Thornhill, I liked it even better. I guess because we jump right into the storyline and we already know who the characters are. We are back with Mac who is a human. This time she is in her father’s presence but not for long. Mac and her friends get captured and sent to a werewolf rehabilitation camp. I love how Mac plays the werewolf so well. She fools plenty of people instead thinking she’s one of them. I also loved that we are back with Jason and Kyle. I just love both boys a little bit and I have a hard time figuring out who I like more. I think the best part of this one was the characters once again. They made me laugh but they also were very likable. I also really did like the plot and seeing how things went down. I can’t wait to read the third and final book in the series! Hopefully soon. Overall: I’m still really torn between Jason and Kyle. I want to like Kyle and I want Mac with him but part of me also likes the Jason aspect and what he brings to the mix. I really liked this one. Cover: I like it! It’s cute! Love how she is just standing there! Minus what sounds like a love triangle, looks like a good read!